Nairobi (HAN) March 31, 2014 – After the devastating WW1, the world seated in 1919 to establish world organization which could monitor international peace and security to make sure that no 2nd World War would originate. Ethiopia is among the few Founding Member States of the UN predecessor League of Nations. Taking the advantage of the League of Nations’ limitations, Mussolini of Italy, Hitler of Germany and Japan began invading countries. That was how the World War Two broke out. As a result, the world experienced another caustic and horrifying war which consumed over 50 million lives and caused lose of countless materials leaving the world torn apart. The globe again sat to establish another International Organization (UN) to effectively limit world peace threat. In 1945, UN has been established by 50 independent states in the spirit of maintaining world peace and stability as to make sure that no Third World War would be instigated. To realize this huge and complex world mission, the UN has drafted various strategies and has been implementing them to ensure healthy relations among different countries prevail. UN has been resolving various complex hostilities effectively occurred in various parts of the world as relatively compared with that of League of Nations. It is crystal clear that there is serious debate among academicians and politicians that the UN has still limitations all over the world but there is common consensus that it has done better than its predecessor at least in impeding World War Three from happening to this date. Since 1945, the UN has faced serious and complex conflicts that are beyond its capacity; practical in point is Iraq’s invasion by US, the world mighty nation. Still there are old and newly more emerging hostilities going on everywhere. Nowadays, nearly all hostilities are based in Africa though the continent has emerged as promising continent in economic, political and security situations. Africa is still facing with considerable concerns of peace and security threats. 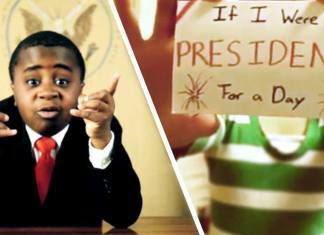 The debate is that who is going to be blamed for all tragedies happening in Africa is still remaining questionable. But there is one fact that all African leaders and other concerned personalities have to contribute at least to reduce all colors of quagmire. Updated Video: Members of the AMISOM Ethiopian contingent in Baidoa are engaged in regular foot patrols in a bid to boost security and eliminate any elements of al Shabaab in the area. Ethiopian troops, as part of the African Union Mission in Somalia, patrol in Baidoa town during a routine foot patrol. Besides being a seat to various International Nongovernmental Organizations (NGOs) and diplomatic seats, Ethiopia is the political capital city of African. This ancient state has been wholeheartedly and constructively contributing to world peace and stability in line with the principles and missions of UN so that the world could enjoy peaceful coexistence. Evidently, it is number one in Africa and the fourth largest peace keeping force producer in the world. The following places are where Ethiopia effectively supplied its own part for world solidarity. It was its first time that Ethiopia dispatched three battalion Peace Keeping Forces UN mandated to Korea in 1951 during which North Korea illicitly invaded South Korea. The three battalions headed by Col. Gebre Teshome had successfully accomplished its UN peace mission. The UN Peace Keeping Mission Chief Commander General Marko Clark poured praises unreservedly over the immaculate heroism of 1st batch Ethiopian battalion aka Kagnew Shi’aleka. The 2nd and 3rd battalion batch arrived in 1952 and 1953 respectively. The total number of Ethiopian Peace Keeping solders was 6037 in its total five rounds. Generally, the Ethiopian peace keeping mission stayed in Korea from 1951-53 and fought bravely and played decisive role to defend South Korea. During that mission, over 121 soldiers died, 536 wounded. No Ethiopian solders, surprisingly, get surrendered during the terrible war making it Ethiopia was the one and only one which did not have a single capitulated solder. This episode was uniquely appreciated and praised by the UN community, Korean and other involved countries. Hereafter, the world and largely the UN area have solid confidence over Ethiopia’s commitment and contribution for world tranquility. The commitment for peace, the heroism and military ethics during which Ethiopians showed there has greatly added to the existing Korean and Ethiopian people healthy relations to this date. Koreans have very positive and brotherly approach to Ethiopians. As a result, South Korea has erected memorial obelisk to Ethiopian martyred. The mineral affluent Congo was in a serious political crisis in the 1960s. Following the official request from the UN, Ethiopia also played enormous role in stabilizing Congo in 1960-63. Through sending its three brigades consisting of 8000 to 10,000 personals under the commandment of Brigadier General Eyasu Mengesha, it managed to stabilize the ups and downs states of Congo. The unique story here is that Ethiopian Let. General Kebede Gebre, the then commander of Ethiopian Peace Keeping Forces in Korea was nominated to be commander chief of UN mandated Peace Keeping Forces in Congo drowned from over 30 countries. This showed how much respect and confidence the UN built on Ethiopia’s commitment to world peace and its disciplined fearless defence forces. During this mission, Ethiopians forces had repeated their golden success gained in Korea. Order and enabling environment for governing was rather restored in Congo thanks to the commitment of Ethiopia. The newly elected current government of Ethiopia that came to power in 1991 ousting the butcher communist militaristic regime led by col. Mengstu Hailemariam has continued discharging the peace keeping responsibility championed by previous regimes. During the transitional government of Ethiopia led by the late Prime Minister Meles Zenawi, it also extensively participated in the world most danger civil war instigated in Rwanda in 1994 to 1995. Ironically, Ethiopia itself was in a cross road as was debated by many scholars that time least to help others. But Ethiopia had to share the pain of African brothers anyway. It was a time difficult for UN to involve in this complicated Rwandan catastrophe turned to be shocking genocide which the world has ever seen after the Jews genocide massacred by Nazi Germany. Almost all countries including even the mighty USA refused to go into Rwanda’s most challenging genocide episode which consumed close to one million lives in a just less than hundred days. Ethiopia was nominated and officially recommended by UN to play its trustworthy peace mission thereof anyway. The peace keeping forces had played decisive role by mainly implementing the four crux peace strategies in disarmament, demobilization, reintegration and rehabilitation tactics which have brought quick and unexpected odor of peace in Rwanda. The Ethiopian forces went to the extent that helping people to have daily food and helping returnee/displaced people as well. Such missions were meant to restore reconciliation process among the various ethnic and tribes to resolve their hostilities in civilized and peaceful mechanisms. That has how helped Rwanda to manage itself which is now among the few African states with bright future. Burundi had also been in social crisis surfaced between the Hutu and Tutsi tribes like that of Rwanda which led to over 200,000 innocent deaths. During this time, Africa has its own Peace Keeping Forces called African Mission in Burundi (AMIB). It was this time that Ethiopia took its African responsibility of maintaining peace to effectively engage in Burundi to pacify the already instigated miserable fate. The main responsibility Ethiopia took was to manage the ceasefire agreement, disarming and conducting rehabilitation process for the people and creating favorable conditions for the UN Peace Keeping Mission to take ground. To implement these above mentioned needed missions, the Ethiopian Peace Keeping Forces known as Wogagen Battalion headed to Burundi as the first African Peace Keeping Contingent. Ethiopian Brigadier General Gebrat Ayele was heading the UN mission in Burundi as deputy chief commander. This shows how much anticipation was given to Ethiopia’s commitment and capability of realizing such complicated peace situations by the UN. Having effectively implemented its mission, the Ethiopian Peace Keeping Forces tranquilized the war torn country-Burundi. Hereafter, the UN Peace Forces were able to conduct their mission effectively thanks to their counterpart Ethiopian forces bravery and sacrifice they have paid. Burundi is now having functioning political leadership though it has to go long way to fully stabilize its fate like other African countries. Ethiopia did not stop realizing its peace mission in Africa here. It went Liberia too for the same mission. Liberia got trapped in deadly civil war following the military coup in 1980 that led to over 250,000 deaths of innocent citizens. This devastating political and economic circumstance was going on in Liberia till 2004. The crisis of Liberia was international in nature as many interest groups were highly involved. The Ethiopian forces headed by Brigadier General Kemal Gelchu had efficiently accomplished the disarmament, demobilization, reintegration and rehabilitation process which were key strategies restore order. Moreover, it went out of its military mission, the Ethiopian forces were highly engaged in humanitarian activities to rebuild the ruined nation. Such pure sense of Pan-African-ism responsibility from Ethiopian side was greatly surfaced in the heart of Liberian people which has becoming the crux for the existing bilateral relationship of the two only African states never colonized and founding members of League of Nations and UN. Liberians are relatively enjoying peace and stability under the democratically elected women presidency. 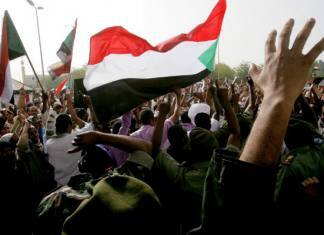 Darfur was autonomous for such long time until it was annexed to Sudan by the British colonist power in 1916. Since 1980s, Darfur has been hugely waging deadly civil war. The problems of Darfur were complex and highly politicized based on social and tribal hostilities, border dispute with Chad and mainly political and economic questions denied by the Sudanese leaders. The case of Darfur was so serious that has attracted immensely international concerns. Out of the 4 to 5 million total population, over 480,000 lives were consumed and 2.8 million people were reported to have been displaced. The UN was extensively and intensively seized of Darfur’s affairs for years without fruitful results. Both Sudan and South Sudan rejected and unanimously decided only Ethiopia could be trusted as peace keeper country in their respective affairs. This is unmistakably unique chapter in history as two neighboring countries never trust their own neighbor state to act as peace keeper. This is concrete evidence that how much Ethiopia is understood that it is playing constructive and peace stabilizing role in the continent and largely in the most volatile region. Ethiopian Peace Keeping Forces are stabilizing Darfur since 2008. 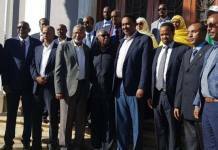 Ethiopian forces are positively engaged in tribal reconciliation, ceasefire and other key activities which gave Sudan promising peace and rooms for political and economic rebuilding scenarios. Abiey regarded as the historical bridge between Sudan and South Sudan has 10460KM2 landmass with its capital called Abiye city. Arabic and English are widely spoken there. This province is mostly over disputed land by South Sudan and Sudan because of its oil rich source deposit. The ownership claim over Abiye by both countries has led to the second longest civil war in Africa. After the comprehensive peace agreement signed by both states in Addis Ababa in 2004, Abeyi became special administrative autonomy. the UNSC resolution 1990 authorized a United Nations Interim Security Force for Abye (UNISFA), Ethiopia sent 4250 peace keeping personal commanded by Ethiopian Let. General Tadesse Worede nominated by UN general secretary Banki Moon as UNISFA commander to maintain peace and security in Abye. General Tadesse Worede is entrusted by the UNSC in June 27, 2011 resolution to make sure that all sorts of forces are out of Abye and to accomplish UNISFA’s mission. Here again the special feature is that it is Ethiopia alone assigned to monitor the peace and security situations. It is evident by itself that how much the international community trusted Ethiopian Army committed for peace, capability to stabilize dense situations, disciplined military conduct that has been seen winning the heart of people practically elsewhere. Abye is now relatively experiencing promising peace and stability thanks to the commitment of Ethiopia and other personalities. Somalia has been in total political collapse since 1991 which become the save heaven for various colors of international hardliners. It has been a country where different global extremists operating their peace spoiling mission which practically weakened the country and consumed untold lives of people. As a result Somalia is labeled as failed state to this date. Though, there is elected government, it could not function properly because of the extremists composed of different warlords who effectively watered it down. Ethiopia had to enter deep into Somalia to raze the warlords who declared jihad and to annex Ethiopian Somali ethnics forcefully. Accordingly, Ethiopian gallant forces dilapidated and went back having broken the dangerous elements who posed serious national threat. The elements were reduced to the extent that they could not conduct militarily offensive or defensive tactics and driven out of major parts of Somalia. Somalis people gained the room to breathe an air of peace for the first time in 23s years. Ethiopia fractured the anti peace elements supported by Eritrean regimes which led to TFG function and take political and economic corrective measures. After all, it is because Of Ethiopia that AMISON could seat their foot in Somalia to maintain peace and stability. Just in two months after joining Ethiopian forces to AMISON, Alshebab is nowhere to be seen and is snatched its base areas. Alshebab is not in the position of conducting any military offensive. It has neither any base areas to claim nor support from the people. Apparently, Somalia is relatively much better off and became much easier for international and regional bodies to reopen their offices in Mogadishu, Somalia’s capital according to Ethiopian Ambassador to Somalia, Wondimu Asamnew. “The government and people of Somalia are rebuilding their ruined country right now”. On late December 15, an armed confrontation erupted at the presidential palace in Juba – a confrontation between army officers loyal to President Salva Kiir and disgruntled soldiers backing his ex-deputy Riek Machar – that has now begun to deteriorate into a civil war. While the African Union (AU) and IGAD characterized the situation as a ‘crisis’, Kiir claims that it amounted to an attempted coup. In just two weeks close to 1000 people were trapped and killed anyway. Most dreadful for the entire region, however, is the possibility of another state failure (Eritrea) in the form of South Sudan, according to Dr Mehari. “With its record of successful and unsuccessful secessionist movements, the Horn of Africa cannot afford another state failure”. Well aware of the situation in the region, the chair of IGAD, Ethiopia did not waste a minute to look into the crisis. PM Hailemariam Desalegn went to Sudan to talk with Salva kiir and other personalities. 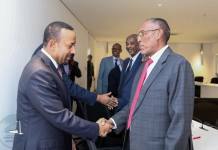 Hailemariam nominated Ambassador Seyoum Mesfin as a special envoy of IGAD to negotiate with the rival forces in Sudan. Hailemariam’s appointment to Seyoum Mesfin indicates how much Ethiopia is seized and concerned of the circumstances of South Sudan. Seyoum is well internationally respected and immensely experienced diplomat who served his country as foreign minister for more than fifteen years. 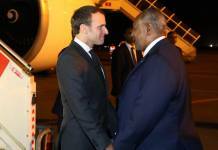 According to BBC, the talks took place so far are fruitful. 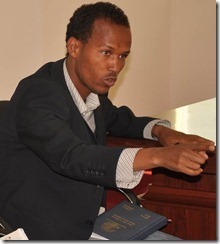 It seems IGAD is handling the case properly. 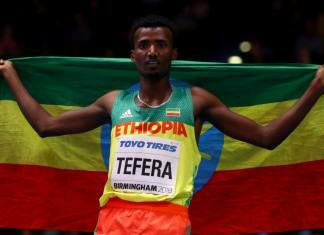 Ethiopia’s diligence role will be repeated here again. “For the long-term stability of Africa’s newest nation, democratisation is necessary, but also insufficient as Dr Mehari put it. Delivery of public services and economic development will be critical”. Generally evaluated, had not been for Ethiopia, the aforesaid states would have remained in ferocious situation, to say the list. It is undeniable fact that Ethiopia has done its own part in contributing peace efforts to the world. Probably the biggest contribution is being itself peaceful. Ultimately, it is up to South Sudanese leadership to decide their bad or good fate. We will see the case in the near time, however. I wish them all the best!